Gazpacho has a long history. We now know it as a tomato based cold soup which is “Spanish”. The classic ingredients are bread (crumbs and croutons), garlic, tomatoes, onions, bell peppers, cucumbers, oil, vinegar, and salt and pepper. Usually some of the vegetables are reserved and sprinkled on top as are the croutons. 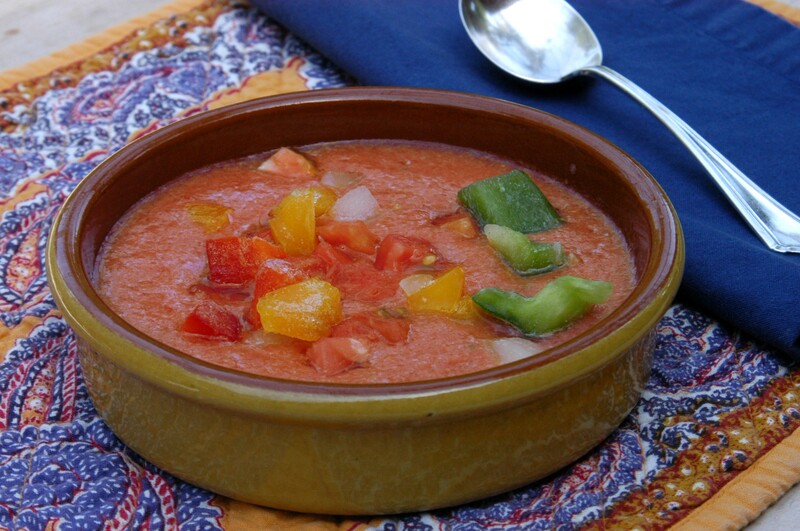 This is the Andalusian gazpacho. But there are white gazpachos as well as red gazpachos, and many variations of both. The ingredients give us a hint of its long history. The “soup” dates from pre-roman times in the Iberian peninsula when bits of stale bread were moistened with oil, a bit of vinegar perhaps. Water was added to make a cold soup. This type of arrangement was possible for soldiers peasants and shepherds to have as a meal on the run. At home garlic was ground with a mortal and pestle along with bread and oil making a paste to which water was added. The name itself is rather a mystery but it is thought to be a corruption of a Portuguese word meaning “bits and pieces”, or “crumbs” as the bread was broken up into pieces…or, perhaps, a corruption of an Arab word meaning the same thing. Almonds were sometimes added to the bread/garlic mixture as well as other ingredients. Then in the sixteenth century Spain conquered Mexico and tomatoes and bell peppers (capsicum) were introduced to the country but it wasn’t until the eighteenth that there is a record of their being used as an ingredient in gazpacho. Seed and dice one green pepper set aside. Cut the crust off the bread and soak in water. Squeeze dry. Set aside. Peel and dice remaining vegetables and put into a food processor along with the bread. Purée the vegetables until smooth. Pour into bowl and add reserved diced tomato and green pepper. Chill. While gazpacho is chilling, prepare garnish. Pour gazpacho into (preferably earthenware) bowls and have guests add their own garnish to taste. As it absolutely typical of standard recipes, there are many variations on the theme with ingredients and their ratios differing a bit from cook to cook both in the white or red gazpacho.